LUND, Sweden -- Some of us believed that at the end of the Cold War in 1991 American and Soviet nuclear rockets would be left to rust and rot in their silos. Mikhail Gorbachev (L) with Ronald Regan. Indeed, we actually saw Ukraine, where the Soviets made most of their rockets and based many, calling in American engineers to help dismantle them. Moreover, Ukraine decided to forsake nuclear power status — for which the world should give more praise than it does. President George H.W Bush and even more so Ronald Reagan before him did quite a lot for nuclear disarmament. 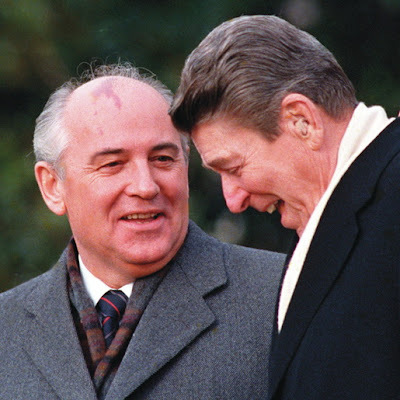 At a summit in Iceland, Reagan and Soviet president, Mikhail Gorbachev, panicked most of their advisors and western commentators when they nearly agreed to total nuclear disarmament. Only Reagan’s persistence in demanding to keep alive research into “star wars” anti-missile systems and Gorbachev’s unwillingness to agree to this stymied an agreement. Both sides were equally at fault. Despite all his rhetoric and bear hugging of Russia’s first president, Boris Yeltsin, Bill Clinton achieved very little. His successor, George W. Bush did only a bit more. Hopes were focussed on Barack Obama who was chosen be honoured with the Nobel Prize partly because it was thought he would be a standard bearer for disarmament. Apart from an initial agreement with Vladimir Putin to reduce superpower long-range rockets down from 2,200 warheads each to 1,500, still enough to blow up most of civilisation, Obama has done precious little. The resistance in Congress to ratifying this pact was immense and passage only came on the promise of spending $80 billion to modernise nuclear forces. Even Bush junior’s plan to base an anti-ballistic missile system on Polish soil to deter Iranian missiles has been modified only somewhat in an attempt to satisfy legitimate Russian concerns about it being used to intercept a Russian attack. More American compromise is needed on this, such as moving the site to Romania, nearer to Iran and further from Moscow and finding a way for Moscow to share the running and control of the system. Turning the page, the US has not ratified the Comprehensive Nuclear Test Ban Treaty, which would help stymie the further spread of nuclear arms to other countries. If you can’t test you don’t know if you have a workable bomb. The next stage in the disarmament process should be getting rid of short-range tactical missiles base in Europe. Moscow is insisting that the first step must be the US removing all its tactical weapons from Europe, which is fair given their proximity to Moscow. Obama has pledged to fight for “a new treaty that verifiably ends the production of fissile materials intended for use in state nuclear weapons”. The idea behind this is to stop in their tracks any country thinking of building a nuclear armoury whilst setting limits on the renewing of warheads by those who already have them. Meanwhile the main issue — the number of long distance super-destructive rockets held by Russia and the US — is not on the agenda despite Obama’s pledge in Oslo to work towards zero possession. The US Senate is an immovable brake on Obama. And the Russians, observing the power of the US Senate to probably refuse to approve any new treaties, stops them suggesting opening negotiations. But how is it, 11 years after the end of the Cold War, that either side can justify nuclear weapons? Is Russia an enemy or is it not? Successive American presidents have said it is not. The Russians say the same thing about the US and Europe. Non-enemies don’t have nuclear weapons pointed at each other. At least that is what basic morality and common sense would say. Certainly they are never going to be used. Don’t the US and Russia want to set an example to the rest of the world, as is their sworn obligation under the Nuclear Non-Proliferation Treaty? After all sauce for the goose is good for the gander might say the Iranians and those in the Middle East that will probably emulate Iran if it does go nuclear. Obama is checkmated. Therefore the world is checkmated. What a terrifying impasse this is.